I have been on the trail for over a week now, though that fact is hard for me to comprehend. I’ve met so many interesting people, seen so many beautiful vistas, and had so many quiet insights that it is difficult to believe that all of this can happen in the span of only seven short days! 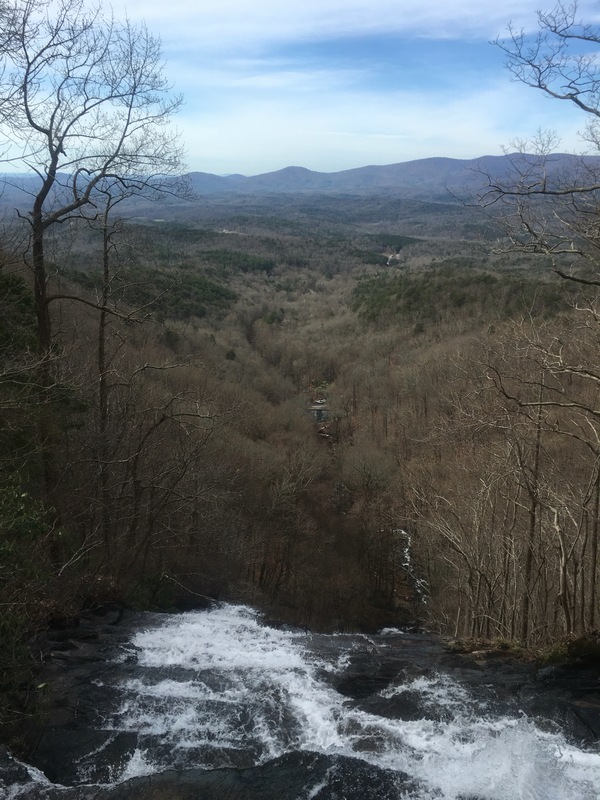 My very first day was mostly spent off of the actual Appalachian Trail, trudging 8.8 miles up an extremely difficult approach trail starting at Amicalola Falls State Park before reaching the AT’s official southern terminus, Springer Mountain. My official starting pack weight of 39 pounds did little to help me as a 604-step climb up the Falls greeted me on the first mile of my journey. And why in the world would I add on a grueling 8.8 mile approach trail that doesn’t even count towards the AT? I wasn’t planning on it originally, until a former thru-hiker told me that it was worth it and that if you can do the approach trail, there’s no reason you can’t do the rest of the trail. Thus, I went, thinking it would be a good litmus test for the real deal. Only 15 minutes into it and I was already out of breath and pouring sweat. I thought to myself, What have I gotten myself into? As I would quickly learn, however, the view from the top is always well worth the climb. Shortly after this, I met some fellow thru-hikers and we formed a solid group over this first week. Every day we encounter other thru-hikers, some that we met previously and are playing “leapfrog” with and others that we are meeting for the first time. There is not one set profile that describes all thru-hikers. It is a very diverse group of people from a variety of backgrounds. Some have just graduated from high school or college, others are retirees, and many are in the midst of a job or career transition. All of them have personal reasons for pursuing the Appalachian Trail, which are as diverse as the people themselves. Overall, we have been blessed so far with beautiful weather. The first two days on the trail felt surreal with sunny skies and daylight temperatures in the 70’s, and only dipping into the low 50’s at night. Reality soon struck, however, as we experienced a heavy downpour overnight and into the morning of the third day. Given my very limited primitive camping experience, taking down camp in the rain was a slow and awkward affair, resulting in nearly all of my gear becoming saturated and laden with mud, save for a few vital supplies left in dry sacks. While it would have been very easy to wallow in the complete misery of it all, especially since there was no indication that the rain would stop anytime soon, I chose instead to hike on. Fortunately, the rain did let up (as it always eventually does) and, once again, I experienced sunshine and absolutely breathtaking scenery. After setting up camp that evening and successfully drying out all of my gear, the rain was only a distant memory. Sometimes you just have to embrace the rain and the mud and trust that the sun will shine again, and when it inevitably does, it will be all the more beautiful and appreciated. With that, my friends, I end this entry and continue my hike out of Georgia and into North Carolina. Beautifully descriptive and inspiring. I’m very excited for you and looking forward to this journey through you- to Maine. May you be blessed every step of the way.